The NBA is back in the UK and you can follow the action across all our Sky Sports platforms as the New York Knicks take on the Washington Wizards. The annual trip to the capital, now in its ninth year and part of the NBA's Global Games Series, brings together two franchises aiming to get their seasons back on track after disappointing, but not unexpected campaigns to date. However, that will not detract from the occasion which often brings out the best in the teams involved as well as giving the NBA's UK and European fanbase a chance to enjoy the sport at close quarters. The NBA's London game always attracts celebrity fans from Premier League players to stars of TV, film and music - and this year Sky Sports will be there to ensure you don't miss a thing. 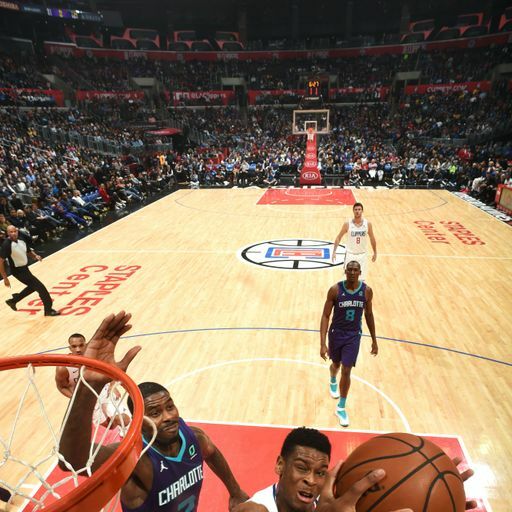 Sky Sports USA is your home of the NBA throughout the season but on Thursday night Sky Sports Main Event and Sky Sports Mix join the party - all the build-up and action is live from 7.45pm. We also have a new-look presenting line-up as Blue Peter's Radzi Chinyanganya hosts our coverage live from The O2. Radzi will have three-time NBA champion Bruce Bowen for company in the studio and, among other things, you can expect a chat with NBA Commissioner Adam Silver. Also part of the team will be commentator Justin Shakil while courtside reporting will come from Sky Sports' Alex Scott who will be mingling with the players, officials and no doubt a few celebrities too. Keep an eye out for additional content too throughout the day on Sky Sports USA, featuring The Starters, a string of high profile interviews including Shaquille O'Neill and Larry Bird, a look back at memorable games and teams from the past and much, much more. Our Game Changers team will also be in attendance for a special NBA episode, aimed at getting more young boys and girls into basketball. As well as Sky Go, our website will be the place to follow if you are on the move. Our pages are now the UK's home of the NBA and if you haven't already done so, get us bookmarked. On Thursday evening, our live blog will bring you all the action with rolling updates, highlights and interviews supporting our live TV coverage and we want your involvement along the way as well. We also have previews, interviews and features to build-up to the game including, including our history of NBA London Live as well as analysis on the two teams involved as we paint a picture of what to expect at The O2. It's access all areas as our teams get in amongst the franchises as they prepare to play in the capital. Sky Sports News will be alongside Sky Sports NBA on site for all the media opportunities. There are open training sessions, media days and a lot more besides so to ensure you don't miss a thing. We will have all angles covered via our @SkySportsNBA account and we also take over the Sky Sports Instagram account for the next few days to give you a flavour of what is going on from the red carpet arrivals to courtside.